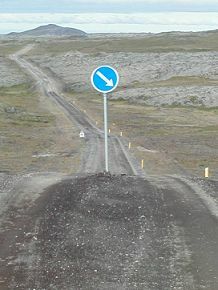 “Keep right” sign on a dirt road on the Snæfellsnes peninsula of Iceland. Photo by Brian Lucas. This is an attempt to list which side of the road people drive on around the world, and to find some reasons why. The most authoritative reference that I am aware of on this subject is a book called The Rule of the Road: An International Guide to History and Practice by Peter Kincaid (Greenwood Press, 1986; 239 pages; ISBN 0-313-25249-1). The book is out of print and difficult to obtain although you might be able to find it in libraries. The Rule of the Road contains a lot of details about why various countries use one side of the road or the other and how they have switched between them. I have relied on Kincaid’s book for many of the historical questions in this document. The list of countries in this document is not taken from Kincaid, and it includes some additional territories as well as being more recently updated. This list has been compiled and contributed to by many people over the years. One of the early maintainers was Dan Jacobson. I obtained it around 1991 by way of alt.folklore.urban and with help from many people I have been updating and expanding it ever since. This document relies heavily on the contributions of readers who send in their observations. Thanks to Mohammed Alquwaizani, Norman Bartlett, George Birch, Alex Boster, Grahame Burton, Andrey Chernyakhovsky, Daniel Bowen, James F. Boylan, Mark Brader, Louise Bremner, Bill Choisser, Jens Brix Christiansen, Douglas Clark, David Clement, Rui Gustavo Crespo, Charles DeBrosse, Joe DeRose, Ron Dohmen, Jay Doty, Jim Dubel, Rob Dvorak, David Easton, Mike Elwell, Andrea Fascilla, Sergey Fedosov, Sander Feinberg, Joe Flake, Alan Flavell, Simon Fletcher, Chris Garrett, Lynne Geisel, George Ghines, Stephen Gosling, Bob Goudreau, Anders Hanquist, The Henry Ford Museum, Nicholas Hodder, David Hoole, Don Howard, Wayne Huffman, Justin Jih, Trevor Jordan, Keith, Mark King, Jeremy Langdon, Paul Erik Leopold, Bill Lockhart, João Madureira, Edwin Man, Brandt Maxwell, Aaron Moreau-Cook, David Morgan, Pete Murdie, Thomas Murphy, Andrew Myles, David Newgreen, Michael Page, Marco Polito, Clint Rodgers, Malcolm Roe, Stewart Rosenberger, Lynn Garry Salmon, Jim Sangster, Michael Scotts, Red Shannon, Anton Sherwood, Michael Schwartz, Krithin Sitaram, Conrad Smith, Ivan Smith, Bill Stewart, Dieter Stuckenbrock, Donald Thomas, Ben Varner, Jon Warms, Bernd Wechner, Jim West, Ken Westmoreland, Bernd Wechner, Brendan Whyte, Howard Wilson, and Eric Zimmerman for sending in comments. The most important factor seems to be the relative dominance of different types of animal-drawn carts and wagons. Most people are right-handed, which leads to a natural tendency to favour one side of the road or another depending on the means of transportation being used. Many people who discuss this topic focus their attention on the role of wearing swords by mounted knights and samurai in the middle ages. However, the role of the sword may have been exaggerated by modern romantic ideas. Medieval road traffic would have been dominated by commoners on foot and transporting goods in carts, who would not have worn swords. The only people who would have routinely worn swords would have been the aristocracy and their troops, and when their wagons rolled, right-of-way was surely determined by rank, with commoners scattering into the ditches on either side of the road equally. Medieval knights were relatively few and far between on the roads, and even if they preferred to pass one another in a certain manner (probably more for ceremony and to show respect than out of a real perception of danger) the protocols they followed would not necessarily have translated into rules applicable to the entire population. Walking: keep right. Most people appear to have a natural tendency to keep to the right. Right-handed swordsmen, however, may prefer to keep to the left in order to have their right arm nearer to a potential opponent, and to reduce the chance of the scabbard (worn on the left) hitting other people. Riding a horse: keep left. A right-handed person finds it easier to mount a horse from the left side of the horse, and it would be very difficult to do otherwise if wearing a sword (which would be worn on the left). It is safer to mount and dismount towards the edge of the road, rather than in the middle of traffic, so if one mounts on the left, then the horse should be ridden on the left side of the road. Horsemen armed with swords prefer to keep left of each other in order that their sword arm is nearer their opponent — and, more often, to offer one’s right hand in friendship. Jousting: keep right. Jousting knights held their lances in their right hands, and it is sometimes assumed that they must have therefore ridden on the left, as swordsmen did. (Kincaid’s book makes this error.) In fact, riders in jousting contests rode on the right (or if you prefer, pass their opponent left shoulder to left shoulder), hold the lance in the right hand, and aim by pointing it to their left, across the horse’s neck. See, for example, photographs of a joust at a tournament from the Academy of European Medieval Martial Arts, the Free Lancers of the Cimmerian Combatives, or the article “how to joust” from the About.com Medieval History section. I have only found one exception to this: a mention of the southern Italian style of jousting as described by the Free Lancers. Thanks to Paul Erik Leopold for pointing out the misconception. 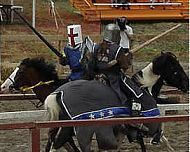 However, jousting is a tournament activity, and far from an example of normal transportation. Leading a horse or a cart: keep right. It appears to be a universal practice that people, being right-handed, tend to lead horses with their right hand while walking on the left side of the horse. To best control the horse and to avoid collisions between wide carts, it is best for the person leading the horse or cart to walk between the vehicle and oncoming traffic, thus keeping the cart or horse to the right. This also facilitates conversations between people meeting, and it is more comfortable for the person walking to be in the centre of the road than to be at its edge. Wagon teams with postilion riders: keep right. In some countries, teams of horses pulling a wagon were driven by a person riding one of the horses in the team. This is called postilion control. A right-handed rider mounts from the left and controls the team with a whip held in the right hand, and therefore must mount the left-rear horse of the team. From this position, the driver has the best view of the distance between his vehicle and oncoming traffic by keeping to the right. Wagon teams driven from the wagon: keep left. In some places, teams of horses pulling a wagon were driven by a person sitting on the wagon. A right-handed driver controls the team with a whip held in the right hand, and so must sit on the far right-hand side of the vehicle, or the whip will hit the vehicle and anyone else seated on the wagon. From the right-hand side of the vehicle, the driver finds it easiest to maintain separation with oncoming traffic by keeping to the left. It is also easier to quickly turn the team to the left than to the right if the whip is in the right hand, so it is better to keep left so that a quick left turn can be made off the road in case of a potential collision. The choice of sides seems to have been governed by the time of introduction of these different modes of transportation and their relative numbers, as well as by social and political influence. Most often, left-hand riding was the initial standard. In areas where carts and postilion riders became dominant, right-hand driving was adopted. In areas where wagons driven from the vehicle became dominant, left-hand driving remained the norm. The next logical question, of course, is why different countries adopted different types of vehicles. Kincaid gives few clues to the answer, providing in some cases a chronology, but no broadly applicable theory. For example, the passenger coach (a wagon driven from a seat on the vehicle) appears to have originated in Hungary, so its earlier appearance there reinforced left-hand driving in much of central Europe. In France, on the other hand, cart-drivers and postilion riders dominated traffic so that the later introduction of wagons driven from the vehicle did not change the established pattern. Did the pope decree left-hand driving in Europe? Probably not. It is commonly believed that left-hand driving was legislated across Europe by papal decree in 1300. However, Kincaid states that he could find no records of such a Europe-wide decree. To the contrary, he finds evidence that Pope Boniface VIII ordered pilgrims on the Bridge of St. Angelo en route to and from St. Peter’s Basilica in the jubilee year of 1300 to keep to the right. Did France change sides of the road in rebellion against papal authority? Probably not. This is a common belief, but Kincaid, besides refuting the existence of any papal order pertaining to the rule of the road in Europe, finds no evidence that left-hand driving was ever common in France. It appears likely that France has always driven on the right. Nicholas Hodder reports a rumor that some pre-Napoleonic pictures show traffic travelling on the left of the Champs-Elysées, but I have yet to confirm this. Did Napoleon make Europe change sides of the road? Yes. France probably always drove on the right, and Napoleon required the countries he conquered to conform to French practice. Many other conquerors have done the same. Did the United States ever drive on the left? Yes. The evidence we have been able to collect is mostly indirect, but it seems almost certain that in the early years of English colonization of North America, English driving customs were followed and the colonies drove on the left, gradually changing to right-hand driving after independence. Kincaid quotes an English author writing in 1806 as saying, “in some parts of the United States, it is a custom among the people to drive on the right side of the road,” implying that in other parts, people still drove on the left. We also know for certain that the colonies farther north along the coast drove on the left well into the 20th century (see the question about Canada below). I have read that the first law requiring drivers to keep right was passed in Pennsylvania in 1792, and that similar laws were passed in New York in 1804 and New Jersey in 1813, but I don’t yet have primary sources for this information so it is possible that these states weren’t changing sides, but only codifying existing practices in law. Other anecdotes from various sources also support the conclusion that most states drove on the left until some time in the early 1800s. American cars had their steering wheels on the right (the best arrangement for driving on the left-hand side of the road) until the early 1900s (see the discussion of this below). However, Kincaid is not convinced that left-hand driving was ever widespread in the American colonies. He points out that the colonists were not exclusively English (for example, the Dutch settlers of New Amsterdam, which later became New York, would have been accustomed to driving on the right), and says that the first vehicles used by the colonists were carts and postilion-control wagons such as the Conestoga, which are best driven on the right. Wagons like the stagecoach (best driven on the left) were not introduced until much later — too late to change the established practice. Did Canada ever drive on the left? Yes, until the 1920s in some areas, but never in Ontario or Quebec. Ontario and Quebec have always driven on the right because the first European settlements in these areas were French. (There were of course plenty of native people living there before the French arrived, but in this as in other things, Europeans made the rules.) In the early European conquest of North America, the French controlled the interior from Quebec all the way to Louisiana, and drove on the right. The English occupied the coast and drove on the left in Atlantic Canada and probably in New England. When the English won control of Quebec from France, the French people living there were permitted to retain many customs, including their language, religion, civil law, and evidently the custom of driving on the right. Settlement continued to spread inland across the continent, remaining on the right-hand side of the road. Newfoundland drove on the left until 1947, and joined Canada in 1949. More information about the changeover in Nova Scotia is given below in the section “Changing from one side to the other”. Which side of the road did they drive on in ancient times? Ancient Rome drove on the left. We don’t know about other ancient civilizations. The following is a list of countries and the side of the road on which they drive. The original source of the list is unknown to me, but it has been updated over the years thanks to the contributions of many Internet users who have visited these countries and reported what they saw. I have deliberately not given dates for countries that have changed sides because this would involve simply copying extensively from Kincaid’s Rule of the Road. If you want to know more about any country’s individual history, see Kincaid’s book. R Drive on the right-hand side of the road (and mostly the driver sits on the left side of the car). L Drive on the left-hand side of the road (and mostly the driver sits on the right side of the car). The United Nations Convention on Road Traffic 1949 Article 9(1) states “All vehicular traffic proceeding in the same direction on any road shall keep to the same side of the road, which shall be uniform in each country for all roads. Domestic regulations concerning one-way traffic shall not be affected.” Despite the obvious advantages of consistency, many countries have a few isolated exceptions where traffic drives on the “wrong” side of the road for that country. Here are a few that have been reported. Conrad Smith reports that he knows of two places in France where one drives on the left. One is at an autoroute intersection between Paris and Versailles where traffic is controlled by lights on a bridge over the motorway. He also reports that there are places on some autoroutes where the carriageways cross in a flyover to allow vehicles to exit naturally to a service area located between the carriageways. Savoy Court is a small private road which gives access to the main entrance of the Savoy Theatre in London. The drive-right rule on this small road was instituted sometime after 1929, so that vehicles queuing to drop people at the theatre would not block access to the Savoy Hotel. It is especially notable because of its intersection with the Strand, a major street in central London. More exceptions are listed in the FAQ list of the Usenet newsgroup misc.transport.road at http://www.roadfan.com/mtrfaq.html#a121. There are no longer very many countries which share land borders and drive on opposite sides of the road. However, it’s not as great a puzzle as it seems, because you normally have to stop anyway for customs and immigration clearance. Generally speaking, you drive into the customs area, park your vehicle for inspection, and then when you leave via the other side of the parking area, you simply make sure you are on the correct side of the road. Andrew Myles: It was not a problem at the only border I have been to like this (Zaire-Uganda). The traffic was slow and there was very little of it. There was just a sign reminding you to swap sides. Lynn Garry Salmon: The border crossing from China (where they drive on the right) to Pakistan (where they drive on the left) merely has a sign at the side of the road that says “Entering Pakistan, Drive Left” and for those going the other way “Entering China, Drive Right”. agsmith: Usually you don’t drive straight through a border post. The only place I’ve crossed a land border where the side of the road for driving changes is between Afghanistan and Pakistan. We drove into a car park (using the right hand side) and after the border formalities, drove out using the left hand side. Douglas Clark: Both Hong Kong and Macao drive on the left and China on the right. In each case, now, when you cross the border, you do so through a car park/customs area and merely exit onto the correct side of the road. In the Channel Tunnel, you don’t drive yourself; when you arrive at the terminal at either end, you park your car on a train wagon, and the train takes you across. When you get off the train at the other end, just choose the correct side of the road. There are two rail tunnels, one in each direction, and trains use the left-hand tunnel. Maintenance and emergency vehicles conform to local standard practice when they are in the terminal areas, keeping left while in the UK terminal area and right in the French terminal. Maintenance and emergency vehicles can also drive in a service tunnel that runs between the two rail tunnels. They pass through an airlock to enter the service tunnel, and while in the service tunnel they keep to the left, says Eurotunnel, the tunnel operators. For more about the Eurotunnel, see this photo of the French entrance to the tunnel provided by Nicholas Hodder, which shows the train tunnel entrances and the service tunnel entrance, or visit the Eurotunnel company web site. During the age of colonization and empires, colonial powers normally imposed their driving customs on their colonies worldwide. Many countries which drive on the left today do so because of the British Empire, with the notable exceptions of the USA and Canada, as discussed previously. Napoleon’s conquests in Europe forced most of the continent to drive on the right in conformance with French practice if they did not already do so. Austria, Czechoslovakia, Hungary, and the Channel Islands changed sides from left to right to conform to German practice during World War II. And more recently, Trevor Jordan reports that the Falkland Islands drove on the right during the period of Argentine occupation in the early 1980s. Many countries have switched sides for other reasons as well. Kincaid’s The Rule of the Road gives some details of the changeover process for many countries. I have received some substantial information about the changeovers in Sweden and in Nova Scotia, Canada, which I will mention here. For all other countries, please refer to Kincaid’s book. 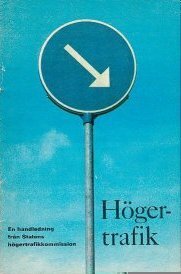 Pamphlet from 1967 about Sweden’s change to right-hand driving. Image provided by Anders Hanquist. A referendum on the question of introducing right-hand driving was held in 1955, with the vote being 82.9% against and only 15.5% in favour of the conversion (see referendum results). However, in 1963 the Swedish parliament passed a law on the conversion to right-hand driving. The change took place in the early Sunday morning at 5:00 on the 3rd of September 1967. A 1960 Scania Vaibis bus, made in Sweden with the steering wheel on the right, for driving on the left side of the road. This particular bus is owned by a Norwegian regional transit company, Setesdal Bilruter. The man in the photo is David Halsall, assistant director of the company in 1999. 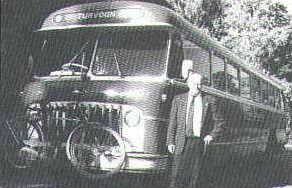 The photo and this information were copied from the December 1999 issue of the online newsletter of Buses International Association. We’re not completely sure when Swedes adopted the practice of driving with the steering wheel on the left-hand side of the car. One reader says that people began buying cars with the steering wheel on the left several years before the change, in anticipation of it; another says that Swedish cars have always had the steering wheel on the left, even when they drove on the left. “Keep to the right” in Nova Scotia, 1923. Photograph provided by Jim Sangster. Nova Scotia switched to driving on the right-hand side of the road on 15 April 1923. Nova Scotia Tramways & Power Company Limited, which owned and operated the electric streetcar system in Halifax, sued the provincial government to recover the cost of changing the doors on all streetcars to the other side, and the cost of changes in track layout. In Lunenburg County, 1923 is still known as The Year of Free Beef; the price of beef dropped precipitously because oxen which had been trained to keep to the left could not be retrained oxen are notoriously slow-witted and many teamsters had to replace their oxen with new ones trained to keep to the right; the displaced oxen were sent to slaughter. The adjacent photograph was taken in the summer or fall of 1923, at Walnut Street, in Halifax, Nova Scotia. The boy is Jim Sangster, then seven years old. 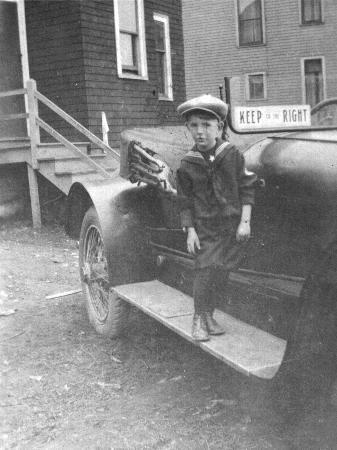 The automobile (make and model not known) belonged to Max Manning (brother of Fred Manning, who built up the chain of Super Service gasoline stations in Nova Scotia). The sign displayed on the windshield is painted on sheet metal and reads “Keep to the Right”, and faces forward as a reminder to oncoming drivers to drive on the right-hand side. The change from left to right had legally occurred on 15 April 1923, but it took time for drivers to get used to it. During the summer of 1923 there were several accidents due to drivers forgetting the new rule and lapsing into old habits. These windshield signs were manufactured in quantity, and sold as a defensive measure to drivers who wanted to reduce the chance of getting hit head-on by an oncoming vehicle on the wrong side of the road. Sudan was driving on the left side of the road under Anglo-Egyptian rule, and after independence in 1956, the new government decided to change the driving rules from left to right. This happened in March 1962. Some remnants of the former system can still be seen, however: it was still possible until recently to find occasional road signs still standing on the wrong side of the road, and driving tests until the mid-1980s had instructions for hand signals based on the driving rules of the past. Today, all cars in the north are LHD, but in newly-independent South Sudan, more than half of the cars are RHD, despite the fact that the rule is to drive on the right side of the road. This is because immediately after the Comprehensive Peace Agreement of 2005, there was an influx of imported cars from Kenya and Uganda, where people drive on the left side of the road. There have been rumours that South Sudan might consider changing driving rules to drive on the left like their naeighbours Kenya, Uganda and Tanzania, in order to support closer integration. Samoa changed sides in September 2009 in order to align with neighbouring Pacific nations such as Australia and New Zealand. Almost always, in countries where one drives on the right-hand side of the road, the cars are built so that the driver sits on the left-hand side of the car. Conversely, driving on the left-hand side of the road usually implies that the driver’s seat is on the right-hand side of the car. The driver generally sits on the side of the car that is nearest to the centreline of the road. However, this is not universally true. In Cyprus, both North and South, they drive on the left. In the North, most vehicles are left-hand-drive models that arrive from Turkey although there are also large numbers of right-hand-drive vehicles as well. George Ghines writes that the South “does not allow any LHD car import, unless it is a short period visitor. There are also exceptions for certain kinds of specialized service vehicles. For example, some vehicles used for postal delivery in the USA are right-hand-drive so that the driver can reach curbside mailboxes without having to get out of the vehicle. Street-sweeping vehicles may have the reverse driving position to place the driver next to the gutter. Norman Bartlett reports that Italian-built trolleybuses were RHD for many years, supposedly to observe the passenger doors better, and some Fiat models were still in service in Milano until the mid-1990s. The arrangement of the accelerator, brake, and clutch (for manual transmission) pedals appears to be the same for all makes of vehicles everywhere in the world. Howard Wilson reports that this is a formally agreed-upon international standard. The location of the gear shift lever for manual transmissions is constrained by available space: it has to be located toards the centre of the vehicle. If the driver sits on the left, the right hand is used for shifting and vice-versa. Many readers report that learning to shift with the opposite hand is the most difficult thing to get used to when driving on the other side of the road. The pattern in which the gears are laid out on the shift lever, however, does not change from LHD to RHD variants of a vehicle type. Both variants use the same transmission, and there seems to be no particular reason to link the shifting pattern with the side of the road the vehicle is on. (Howard Wilson) But according to Grahame Burton, single seat race cars, even ones made in England and Australia, nearly all have the gear change on the right hand side. The location of the turn signal lever (indicator stalk) is not standardized although most often it is mounted on the left side of the steering column. This includes right-hand drive vehicles in the UK, as well as left-hand drive vehicles in continental Europe and North America. Vehicles built in Australia and Japan, however, have the turn signal lever mounted on the right. (Howard Wilson, Martin Rich) A lot of slightly older British cars also had them on the right. (Simon Fletcher) In many cars the turn signal lever and controls for windshield wipers are located on opposite sides of the steering column, and several readers have reported a tendency to clean the windshield instead of indicating turns until they got used to this. The control is located on the left side, the logical place, for the following reasons: Travelling along the right side of the road the steering wheel on the right side of the car made it necessary to get out on the street side and walk around the car. This is awkward and especially inconvenient if there is a lady to be considered. The control on the left allows you to step out of the car on to the curbing without having had to turn the car around. In the matter of steering with the control on the right the driver is farthest away from the vehicle he is passing, going in opposite direction; with it on the left side he is able to see even the wheels of the other car and easily avoids danger. With the wheel at the left, the hand levers are operated with the left hand leaving the right hand to do the more delicate work of steering the car. Michael Scotts writes that he has a Cadillac book which states that all their US cars were right-hand drive until 1915, when there was the option of taking left-hand drive. Soon after 1916, they were left-hand drive only. Left: Australia, Belgium, France, Hong Kong, India, Ireland, Italy, Japan, Portugal, Singapore, Sweden, Switzerland, Taiwan, UK. Right: Canada, Denmark, Finland, Germany, Hungary, Netherlands, Norway, Romania, Russia, USA. It is important that road traffic be consistently on the same side of the road, but since railways are highly controlled and don’t always interconnect, there are many exceptions to the general rules of train operation. In Korea, trains drive on the left, presumably because the railroad system was built by the Japanese (who drive on the left) when Korea was a Japanese colony. The Seoul subway, on the other hand, was constructed beginning in the 1980s with French aid; by that time, Korean and French drivers were both driving on the right, so the subway does too, except for one line which connects directly to the National Railway, and which therefore must be on the left. “It can be confusing when deciding which side of a concourse to board a train,” says Douglas Clark. In Russia, most trains run on the right, except for the line between Moscow and Ryazan, which was designed and built by British engineers (reported by Sergey Fedosov). Metros run on the right except for the Nizhniy Novgorod metro line 2, which runs on the left for easier interchanges with line 1; apparently this is a temporary measure and when the lines are extended past their interchange at Moskovskaya station, they will both revert to right-hand running (Andrey Chernyakhovsky). The worldwide convention for all water traffic is to keep to the right, and to yield to traffic approaching from the right. But there are exceptions. Mark King writes, “Although boating on the high seas is keep right, there is no such rule on French canals, where each bridge has a sign indicating which side this time.” Mike Elwell and Pete Murdie report that on the River Rhine traffic keeps to the usual sea navigation practice of keeping right, but some negotiation is permitted. A vessel travelling upstream can request downstream traffic to change to the left side of the river when the river bends to the left (going upstream) and the current is much stronger on the right side of the river. The request is made by displaying a blue signal board, one metre square, on the starboard side of the vessel’s bridge. The board has a flashing white light in the middle (frequency about one flash per second). Downstream vessels, if they agree, will accept by displaying their panel; otherwise the normal rules apply. The placement of the operator’s seat in a boat is the opposite of the practice for cars. A car built for driving on the right-hand side of a road has the driver’s seat on the left, but boats which keep to the right in their channels, have their “driver’s seat” (helm) also on the right. The placement of the helm comes from ancient practice: before it was possible to put a rudder on a boat’s centreline, boats were steered with a “steering oar” which was hung from the right-hand side of the vessel because the majority of sailors were right-handed and preferred to hold it in their right hand. (“Steering oar” eventually gave us our word “starboard”.) So the helm has always been on the right-hand side of the vessel. And because the helmsman is on the right, the right-of-way rule for water traffic became that vessels have to yield to traffic approaching from the right, where the helmsman can most easily see them. On large modern ships, the pilot or officer of the watch is still stationed on the starboard (right) side of the bridge, but these days the helmsman is often positioned on the centre line so as to have a clean view down the centre of the ship. The rules about which side of the road people drive on are clear, but there are also “rules” that govern how pedestrians behave in relation to each other. These pedestrian rules are not usually codified in law (a proposal to legislate a “fast lane” for walking on Oxford Street in London notwithstanding) but form a sort of “standard practice” which many people are not even consciously aware of until they travel to a country with a different standard practice and end up bumping into the locals. In this section, when we describe pedestrians keeping right or left, we mean right or left in relation to other pedestrians on sidewalks, in hallways, and in pedestrian-only areas. We’re not talking about pedestrians in relation to cars. That situation is universally covered by law or at least by parents’ instructions to their children, as follows: for greatest safety, pedestrians walking on or next to a street that has no separated footpath are advised to walk so that they are facing oncoming motor vehicles, no matter which side the cars are on. This means that if cars keep right, then pedestrians should walk on the left side of the road facing oncoming traffic, and vice-versa. In the London Underground, some of the foot tunnels have signs (not always obeyed) asking passengers to keep to the left, and in some cases there are even railings down the centres of the tunnels to separate people walking in opposite directions. Sreekumar Ashok writes that in India, just like in the UK, there is no predominant side for pedestrians and they use the same techniques to avoid a jam. Keep left: People in Japan keep left when walking. Tourists in Japan should remember this, says Jay Doty: “When you walked on the right you were definitely a hinderance to traffic.” Conversely, Japanese tourists cause traffic jams in other countries: Wayne Huffman reports from Hawai’i that he has “had countless Japanese people walk directly into me, even though I am 6’4″ and 220 pounds. If someone is coming at you and you step to your right, they step to their left, and you stay on a collision course. This happens to me at least five times a day.” There is a weak tendency to keep left in Australia and New Zealand, although many people report that the tendency is weak indeed. David Hoole says, “Australians… are even more unruly than the English,” and he’s not referring to Aussie-rules football. Bill Lockhart mentioned that he has observed Mexicans fighting the flow by trying to keep left in Texas when everyone else was keeping right, and wonders if keeping left might be the standard practice in central or southern Mexico. David Newgreen recalls sailing from England to Australia in 1966-67, when the safety briefing instructed passengers that in case of emergency, they were to keep to the right-hand side of staircases and passageways. The briefing stated, “we emphasise this for the benefit of Australian and New Zealand passengers who normally keep to the left.” Edwin Man reports that in Hong Kong there is a slight tendency to walk on the left. Brendan Whyte noted that although Australians normally keep left, the spiral stairs in the Ballieu Library at the University of Melbourne have a sign saying “keep right.” This is apparently for safety reasons, as further explained by Kendall Lister. The steps curve to the right, or clockwise, as you climb them, and they are very narrow on the inside of the curve. Narrow stairs are easier to climb than to descend, because people usually put only the front part of their foot on a stair and don’t use their heels. Therefore, it is easier and safer to climb on the inside of the curve, and descend on the outside where the stairs are wider, meaning that one should keep to the right. This discussion brought up the question, why do the stairs curve in the direction that they do? Traditionally, they curve right or clockwise as you climb them, because it was easiest for someone armed with a sword to defend a tower if they curved in that direction. Spend a few minutes chasing freshmen up and down the Ballieu Library staircase while waving your right arm about, and you should soon be convinced that it is easier and more effective to brandish a sword if your sword arm is towards the outside of the curve. (Use of real swords is not recommended if you want to retain your book-borrowing privileges.) So the owner of a spiral stair will prefer to defend while facing counter-clockwise, and to have unwanted guests approach in a clockwise direction. We assume that most often, the unwanted guests will be trying to climb rather than descend. All of this assumes a right-handed swordsman and a staircase which is wrapped around a central support of some kind. A staircase which follows the inside wall of a structure and has open space in the center would operate in reverse, as would a staircase which is meant to be defended from below instead of from above. I have heard a rumor that there is at least one Scottish castle built by a family with a strong tendency towards left-handedness, which has staircases curving the other way around. That makes for a good story but seems impractical because I would not expect members of the family owning the castle to be on the front lines of defense most of the time. It would be their hired mercenaries, who would have the normal distribution of right- vs. left-handedness, who would have the job of blocking the staircases. In London, England, people walk every which way on the level but follow a very strict “stand on the right” discipline on escalators to allow people to walk up or down on the left, although elsewhere in the UK, people stand still on escalators and it is impossible to pass. Everywhere in the UK, when there is a pair of escalators, the one you can step on to (going away from you, whether up or down) is always on the left, and the one on the right is always coming towards you. Another interesting choice that pedestrians must make is which way to go through a revolving door. In North America and continental Europe, people keep to the right when they pass through revolving doors, and the door rotates counter-clockwise as viewed from above. Alex Boster reports that in Australia and New Zealand, the situation is reversed and people keep to the left. As a tourist, “the second biggest danger to life and limb… was not to get smacked in the face by a revolving door.” Joe DeRose writes that in Atlanta (USA), there is a restaurant (the Tavern at Phipps) which has a “large antique revolving door at one of the entrances. A prominent sign on the door reminds people to enter to the left, and explains that the door was originally installed in London in 1908.” Practice in the UK varies; you enter some doors on the right, and others on the left! Aircraft keep to the right. In fixed-wing aircraft, the pilot (captain) sits on the left. In helicopters, the pilot sits on the right. The explanation for this which appears below is excerpted from comments by Michael Fortescue in the New Scientist web site. For the full explanation, see: http://www.newscientist.com/lastword/answers/661transport.jsp. By the end of the First World War, the rotary engine was the most common design for powerful fighter aircraft. In this layout, the cylinders were arranged radially around the propeller’s axle, and the axle was fixed to the aircraft so that the entire engine spun around it. The momentum of the spinning engine kept it turning even when it misfired, giving a fair chance of recovering if a misfire occurred. When it came to steering rotary-engined aircraft, turns in one direction were with the torque of the engine, while turns in the opposite direction were against it, and required much more rudder movement to compensate. It so happened that the most successful manufacturer’s engine spun in the direction that made left turns easier. As a result, pilots chose, whenever possible, to turn left, and the traffic patterns around airfields as pilots manoeuvred to land usually involved only left turns. When side-by-side seating became available (pilot and passenger, or pilot and co-pilot in larger aircraft), including in later First World War bombers, the left-hand seat was usually configured for the pilot (with more complete instruments and controls), because that seat afforded better visibility for the relatively frequent left turns. Early aviators would often navigate by following roads and railways. Indeed, on some routes across the deserts of the Middle East, furrows were ploughed in the sand so that pilots could follow them. Aircraft flying in opposite directions along the same line would need to pass each other “port to port” (that is one aircraft’s left-hand side to the other’s left-hand side), so pilots tended to fly with the line they were following on the port side. In other words aircraft drove on the right. Norman Bartlett reports that during the development of the V-22 Osprey tilt-rotor aircraft, which flies like a fixed-wing aircraft but can tilt its rotors to take off and land like a helicopter, there was a dilemma in choosing where the captain’s seat would be. Would the new aircraft follow the fixed-wing standard and seat the captain on the left, or follow the helicopter standard and seat the captain on the right? The US Marines decided that the landing and take-off phases were the determining factor, and placed the captain on the right. Driving on the Left hand side of the road is better for humans, since most of as are right handed. In manual gear transmission the steering must be on strong right hand and the gear on the weak left hand. Nature loves rightness or truth. Sorry, the date should have been 1905. The earthquake happened in 1906. This is a link to a movie taken in 1906 San Francisco http://www.youtube.com/watch?v=oubsaFBUcTc. It can be found by searching for “San Francisco 1906 film”. All traffic is driving on the right side of the road and all the drivers are on the right side of the cars or horse drawn carriages. what country do people drive on the left side of the road????? I was just digging through some old posters I have and found one from the switch in Iceland that my dad got when over there with the military back in 1968 that was issued by the Right Hand Traffic Commission of Iceland that carried the warning: “ATTENTION! MAY 26TH ICELAND CHANGES OVER TO RIGHT HAND TRAFFIC” with an arrow showing a move from the left hand side to the right hand side.